Find all the Sci-Fi and Fantasy reads you’ve been craving in one fantastic set! Whether it’s alien invasion or dark fairytales, heart-pounding galactic adventures or cyberpunk romance, Dominion Rising will satisfy with a thrilling mix of 23 BRAND NEW novels set in fantastical realms. 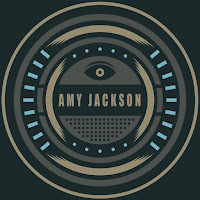 Sword and sorcery, far-flung galactic empires, alternative history, epic magic, slipstream futures: this collection of carefully selected, exclusive novels is sure to please and delight readers of speculative fiction. 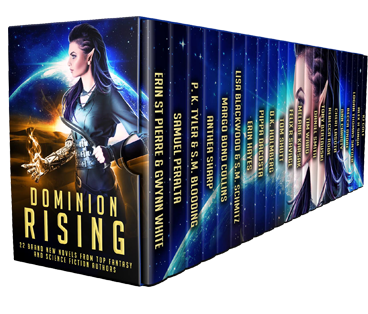 Dominion Rising brings you a galaxy of talented authors, including New York Times bestselling authors Gwynn White, Margo Bond Collins, Tom Shutt, Felix R. Savage and Erin St Pierre; USA Todaybestselling authors P.K. Tyler, Anthea Sharp, S.M. Schmitz, K.J. Colt, Dean F. Wilson, Lisa Blackwood, Marilyn Peake, JC Andrijeski and Erin Hayes; and award-winning and Amazon bestselling authors S.M. Blooding, Melanie Karsak, Timothy C. Ward, Daniel Arthur Smith, Tony Bertauski, Rebecca Rode, Cheri Lasota, Ann Christy, Becca Andre, Logan Snyder, Ella Summers, and Best American Science Fiction and Fantasy notable Samuel Peralta. 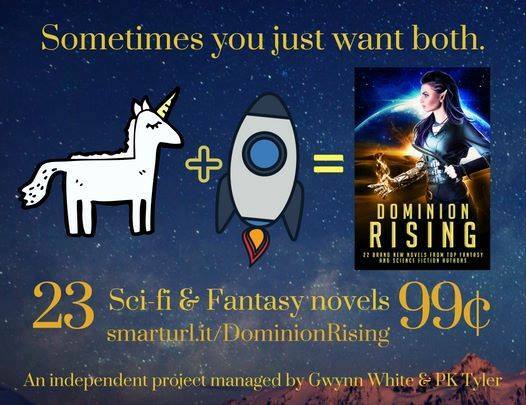 The authors of Dominion Rising are bringing you brand new 23 science and fantasy stories for just $0.99—and you could win big just by reposting this post and talking about the giveaway with the hashtag #DominionRising. Ends August 15, account must be public.